It must be new fashion style, clothes 2 sizes too big! Yes I agree, the last few outfits she's worn, seem to have be a little too big on her !Do you think she's lost more weight since having Prince Oscar ? Quand elle attendait son bébé c'était 3 tailles en dessous ! I love victoria and daniel they are so melt my heart all the time love sweden. Victoria's taste in clothes is going from bad to worse. I didn't care for the outfits she wore in New York, but this one is really ill fitting and dowdy. And that hair! I DON T LIKE THE OUTFIT. 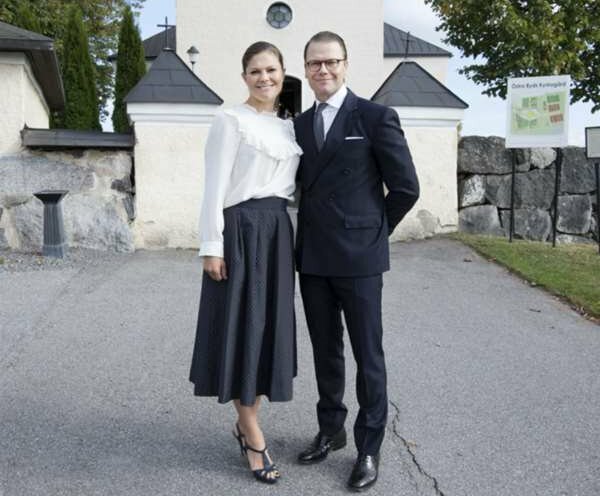 Have you noticed that CPss Victoria and prince Daniel have the same slicked back hair? Daniel seem to channel his inner Pacino à la The Godfather look but I prefer more feminine hairstyle choices on women (if Victoria prefers her hair out of her face, then there are so many styles that can keep your hair from your face but still look beautiful and flattering). Do not like Victoria's outfit and shoes at all! Very outdated and illfitting. Avant leur mariage Daniel portait les cheveux un peu longs et souples ,la princesse des coiffures floues . Depuis le mariage CATASTROPHE CAPILLAIRE.Daniel perd ses cheveux et Victoria ressemble à ma grand mére.Trop de gel sur les cheveux.